One Night in Bangkok – travelographie. Most travelers to Southeast Asia will probably begin and end their journey in Bangkok. After those disorienting international flights halfway around the world, it only makes sense to spend a night here to get a taste of what Bangkok, and Thailand, have in store for you. The dazzling temples, food stalls and street hawkers of yore are still there, but they are now nestled in between sleek skyscrapers bearing names of multinational companies and homegrown Thai businesses. 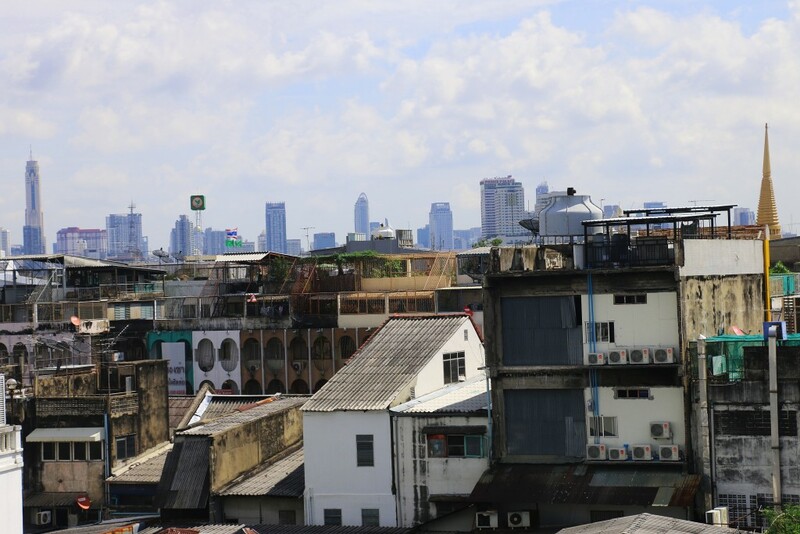 In the distance, high-rises provide an optimistic backdrop for Bangkok’s future, while older apartment buildings with corrugated roofs and golden spires of Buddhist temples still fill the foreground. 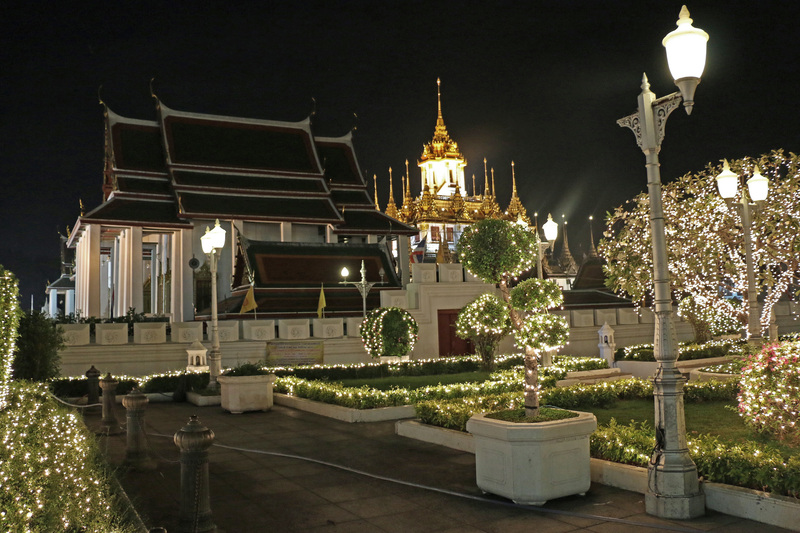 It’s the best of both worlds, but there can be doubt about Bangkok’s trajectory. For a city of 10 million, Bangkok is clean, calm, stylish, and well run. As we soon discovered, these first impressions hold true for the entire country. In our taxi from the airport, the traffic was as to have been expected from a sprawling world metropolis: even at 8pm, the highways were still a mess. But the cars were almost all new or in excellent condition (nothing rusts in this glorious climate), and people were driving at a reasonable speed, obeying traffic rules. My expectations of Bangkok were, well, more seedy than chic. In the movies, this city is always depicted as a character of the night, neon-lit, with frenetic shots snaking through back alleyways, opening up onto clandestine establishments where anything can be procured for the right price. I suppose when I booked our hotel near the legendary Khaosan Road, the first stop for many visiting southeast Asia, I half expected this depiction to be a little bit true. 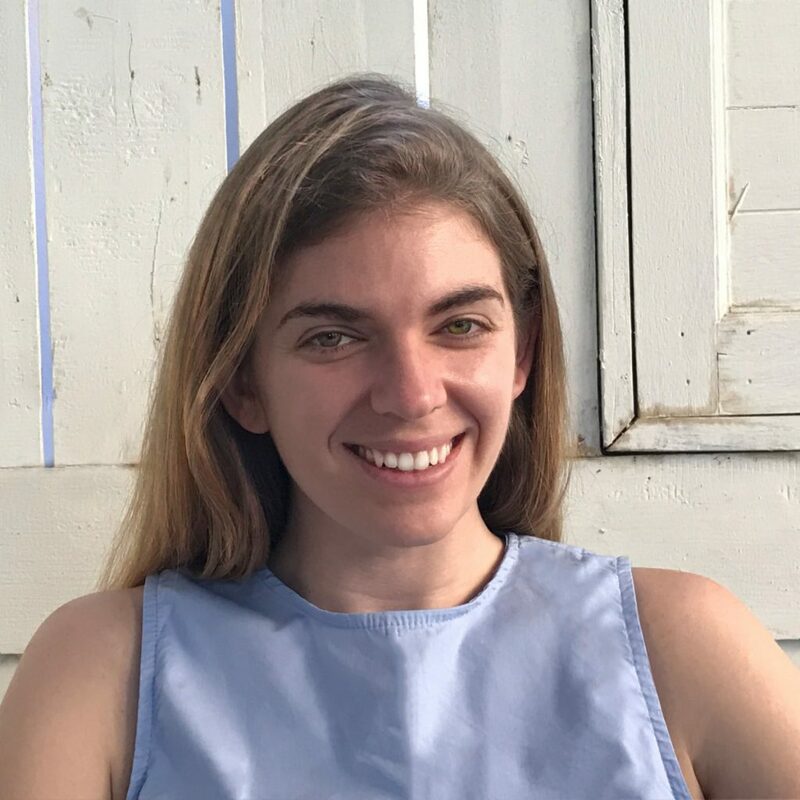 But on the Khaosan Road, Bangkok’s main drag of traders, travel companies, guesthouses, its purveyors of illicit delights have all but been replaced by stalls selling elephant T-shirts and bootleg Northface backpacks, burrito joints, and trendy coffee shops. It was crowded and colorful and a bit chaotic. Yes, there were Western tourists of a certain age escorted by young Thai people through the night. But no one paid them much attention. And yes, there were a few stalls selling roasted insects, a delicacy in Northern Thailand, but the only thing actually being sold at these stalls was the photo-op for tourists, at 10 Baht per shot. Like every modern city, gentrification has arrived in Bangkok and has even managed to tame the wilds of Khaosan Road. 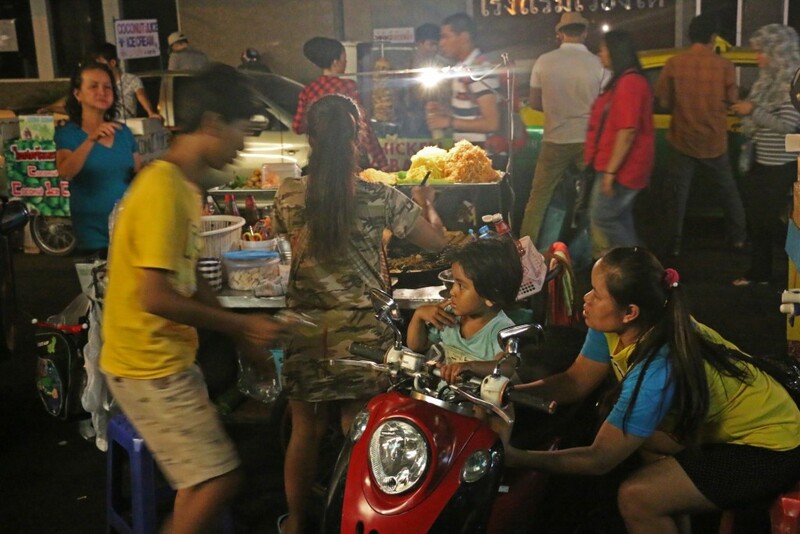 On the outskirts of the tourist drag, street food peddlers set up shop, selling mostly to the Thais working at the massage parlors and shops on the Khaosan Road. These are the places to eat: the hawkers toss together rice noodles, bean sprouts, a protein of choice, and garnish it with something magical (as I learned later, fish sauce, tamarind, brown sugar, and lime) and serve it up on a banana leaf (nature’s alternative to Styrofoam) for around one dollar. 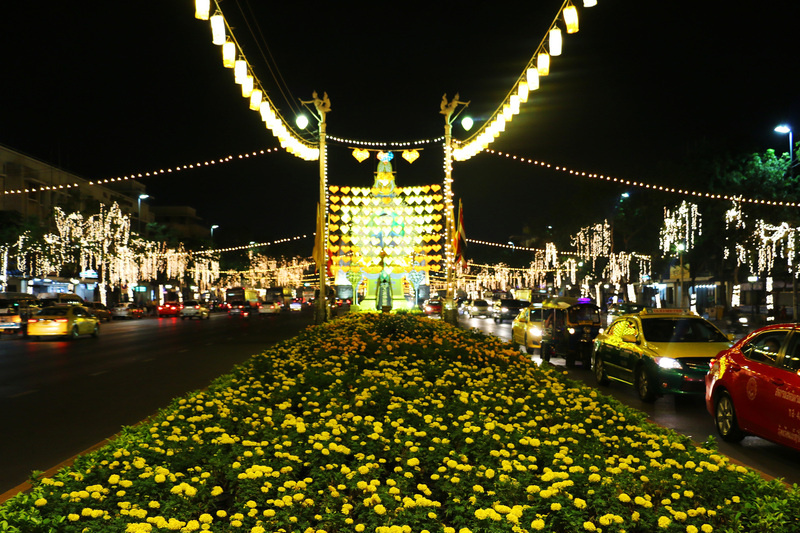 Feeling jet legged but electrified to finally be in Bangkok, we start walking along Ratchadamnoen Klang Road, a wide boulevard illuminated with white lights, marigolds, and displays prominently featuring the King’s noble visage. Together with the grainy images of the King in a range of benevolent poses, the soft white light bestowed the city with a kind of peace that was at odds with any depiction I have ever seen of Bangkok. We rounded Democracy Monument and ended up at the Royal Pavilion Mahajetsadabadin, which was lit up like a good dream. 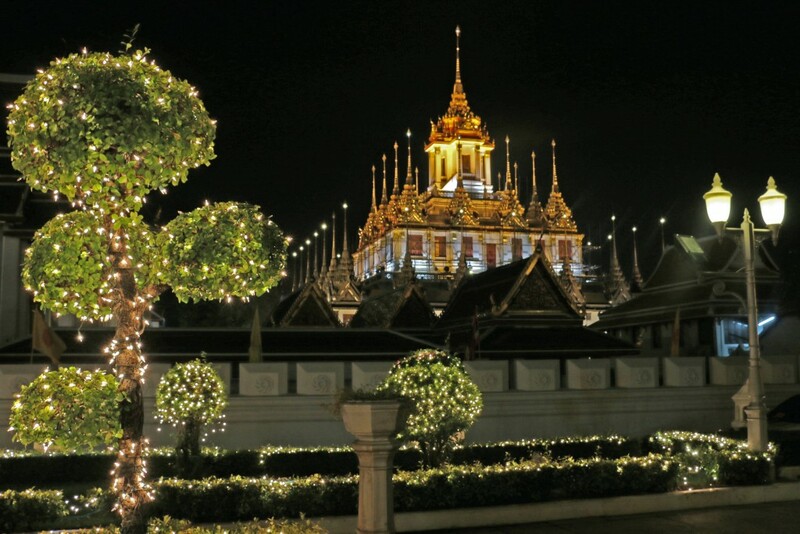 Just behind, the beautiful nineteenth-century Buddhist temple Wat Ratchanatdaram shone against the night sky. Its 37 metal spires represent the 37 virtues that lead to Enlightenment in Buddhist belief. I was beginning to suspect that Thailand has mastered most, if not all of these. As we walked down the boulevard, the warm, slightly muggy night air soaked up our cares, and home felt very far away, another life ago even, and we wandered, dazzled, through the twinkling night. It is sad that so many foreigners end up in Khaosan Rd when Bangkok has so much more to offer. KSR is a ghetto of drunk foreigners and the scummiest Thais who are there to rip them off. I have lived in Bangkok for about 3 years and can tell you that KSR is not Bangkok. In any case, we flew out the next day to Krabi so we just had one night. But it still made a big impression, I’d say. Next time I go back, I’ll spend a few more days. Not on the Khaosan Road, though.